Moving to the US to attend business school is something of a family tradition for Srinivasan Masti. His cousin relocated from Bangalore to Columbia Business School five years ago. His uncle had already made a similar move and now teaches at New York University’s Stern School of Business. 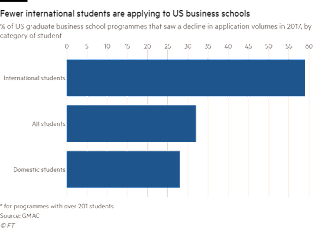 Falling demand for the traditional two-year MBA is a big concern for US schools, many of which suffered a decline in applications between 2014 and last year, according to data compiled by the Graduate Management Admission Council, the business school entrance exam administrator. 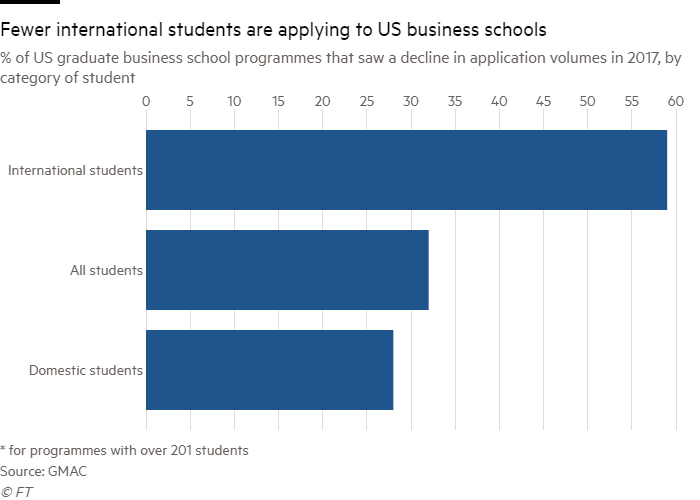 Given that applications have been rising at the same time for rival one-year MBAs offered by many European business schools, the suggestion by GMAC is that US schools are suffering because of their longer course length. The cost of tuition fees at top US schools, which have risen faster than salary increases achieved by students after graduation, is another concern for applicants. Quality is another factor: US schools at the top of rankings have record numbers of applications, while the majority further down must work harder to recruit students. 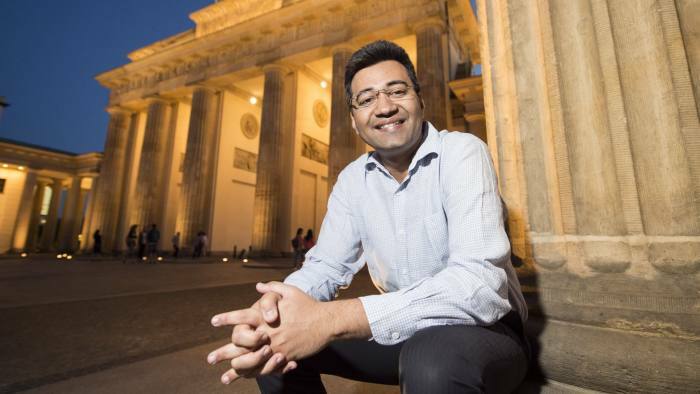 However, research by the FT among a selection of US schools on its Global MBA Ranking found that, for many suffering declining applications, it is overseas students like Mr. Masti who are losing interest in the American MBA. Eight of the 17 US schools in the FT list approached for detailed admissions data said that application numbers were down. At all but one of these, applications from US citizens have increased in the past year, while interest from overseas applicants has fallen. The number of Americans applying for the two-year MBA degree at Carnegie Mellon University’s Tepper School of Business, for instance, increased by 5 percent in the current admissions cycle. But overall demand for the course was down 9.8 percent because applications from overseas dropped 16.8 percent. At the University of San Diego School of Business Administration, a 2 percent increase in applications from US residents this year contrasted with a 31 percent drop in applications from other countries. This matters because 59 percent of the school’s MBA class is from outside the US. China and India are the two largest sources of overseas students on San Diego’s MBA course, but applications from the two countries were down 34 percent and 4 percent respectively. Kacy Hayes, the school’s assistant dean of graduate programmes, says some students may be put off by a perception that the US is less welcoming to foreign nationals. But there are other factors behind the drop, she says. For instance, many admissions teams in US schools now use technology to detect applications from China that make fraudulent claims. The growth in reputation and capacity of Asian schools has meant students from that region may be less inclined to study overseas, according to Ms. Hayes. Aditi Sharma, a former consultant at Cognizant Technology Solutions, near Delhi, did plan to study abroad for her MBA, and was offered a place at Hult International Business School’s San Francisco campus and also at the UK’s Durham University Business School. She opted for the latter, and the reputation of the UK education system, Durham in particular, was the important factor in choosing its course, says Ms. Sharma. Her fees are £23,000 ($31,000) after deductions from scholarship funding: substantially less than the $75,000 she would have paid at Hult. Work visas are still a problem. In the UK, overseas students have only four months to find work after graduation, while if she had chosen to study in the US, Ms Sharma would have been able to stay for a year after graduating under the Optional Practical Training programme. For many students, choosing a place at a business school outside the US is a positive choice. Masti, for example, chose a German MBA over a US course primarily because of the benefits of moving to Europe’s largest economy, and the option to work in other EU countries without having to apply for separate visas every time he moves.